I am not a big fan of copy protection, DRM or anything that prevents the freedom me and how I handle products I bought in future. Is it an app I bought with the G1 and copying it onto my Nexus One, or an old LP that I want to use on my new LP player. Therefore, I am always kind of skeptical when it comes to copy-protection mechanisms. Of course, as a mobile application developer for about 6 years (that’s longer than people know the word iPhone) I have to admit that I thought about those kind of thing a bit in the past. However, IMHO my time is better invested in adding new features to apps, create new apps and hook up with all the users to figure out what the heck they actually want – rather than trying to punish them with copy-protection mechanisms that are just annoying. 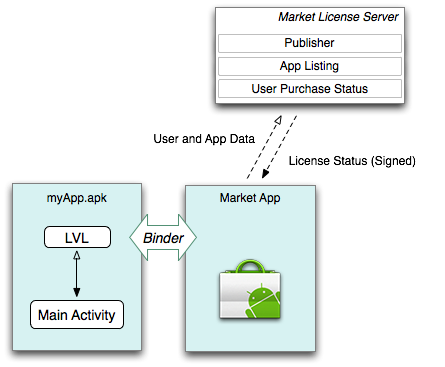 With Google recent announcement of the License Server for Android I have to say, they put out a good piece for developers and for users. I haven’t used the License Server yet, but from what I read in the blog article and Android docs (see links below) it looks like a solid mechanism that allows developers some basic protection via verifying whether an app has been bought or not. And to be honest, that’s all you need! By leveraging the Android Market infrastructure this library actually puts more value to developers if they use the Android Market. Honestly, the Android Market could use a major round-up upgrade of features and usability. However, it works so far and it gets better. Step-by-step, but hey, it gets better! Well done Google. I like this approach and I will definitely use it in future apps as well as in exsiting apps. It’s time for an app update week!